Separating Main Street from John Mackintosh Square is the Parliament building. Built in 1817, this pillared structure was originally the Exchange and Commercial Library. The town's prosperous merchants were excluded from the Garrison Library, which was also a club for British officers, and so they decided to build their own library. In addition to the library, the new building housed an auction room and was a meeting place for merchants. 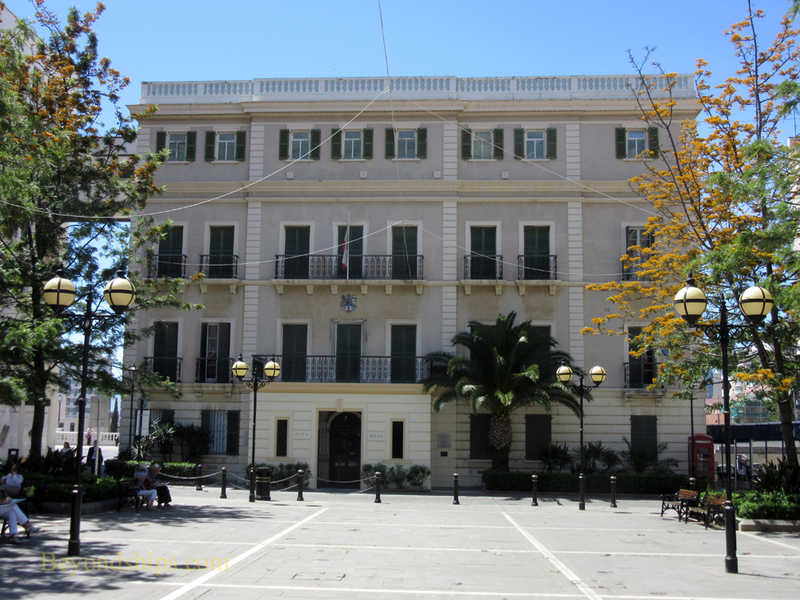 It has been used by the Gibraltar Parliament and its predecessors since 1969. John Mackintosh Square, named after a local philanthropist, has been the city center since the 14th century. In 1939, an air raid shelter was constructed under the plaza. During that construction, no traces of earlier construction were found suggesting that this space has never been anything but a plaza. In Spanish times, it was Gibraltar's plaza mayor and the British used it for military parades prior to the creation of Casemates. At the opposite end of the plaza from the Parliament building is the City Hall. This was originally built as a private mansion by a Jewish merchant Aaron Cardozo in the early 19th century. 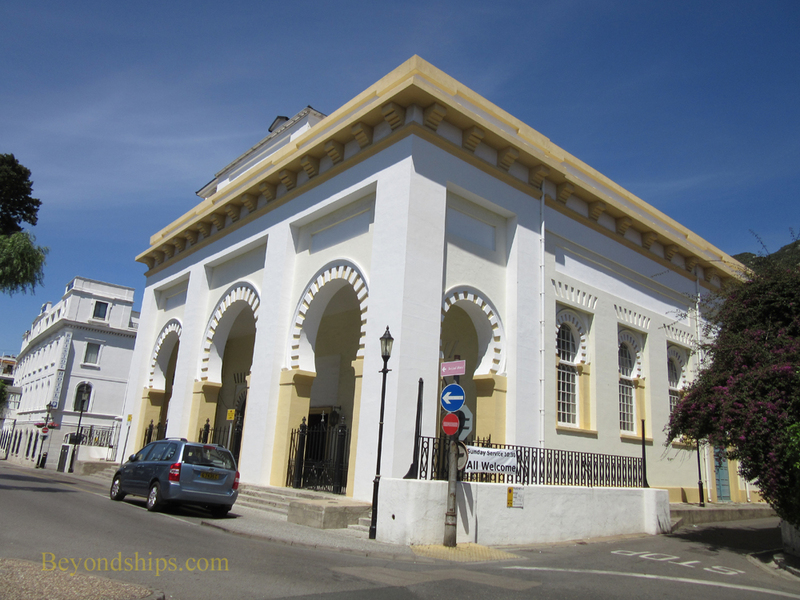 At the time, Jews were not allowed to own property in Gibraltar but Cardozo had been a friend of the late Admiral Lord Horatio Nelson and was given a dispensation provided the house was suitably grand. Cardozo did not disappoint spending some £40,000, which in those days was a vast fortune. 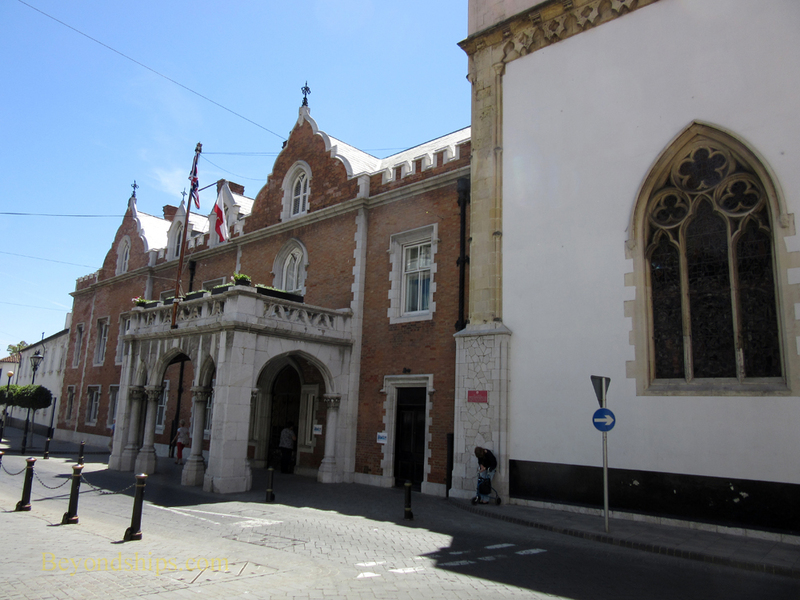 In addition to its governmental function, this building now houses the Gibraltar National Gallery. 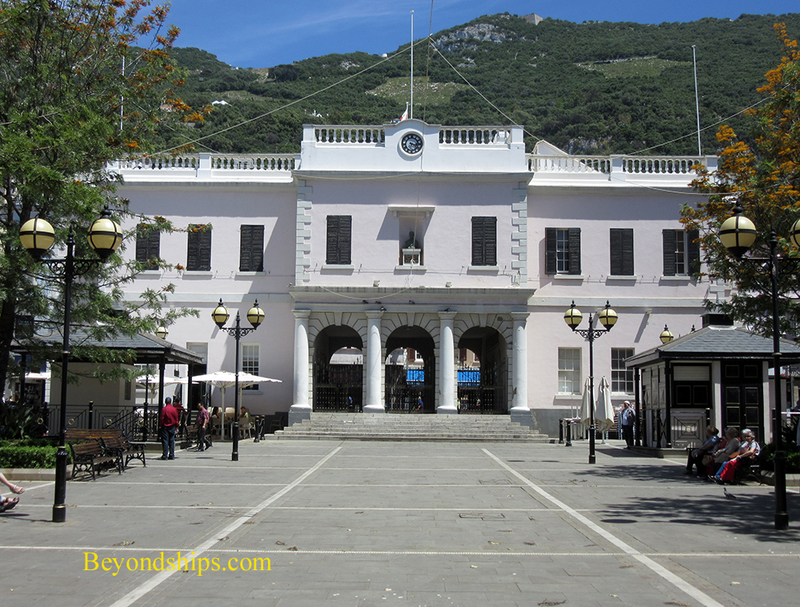 Returning to Main Street, you come to the Gibraltar Supreme Court. Enclosed behind a gate and several rows of trees, this building is barely visible from the street. 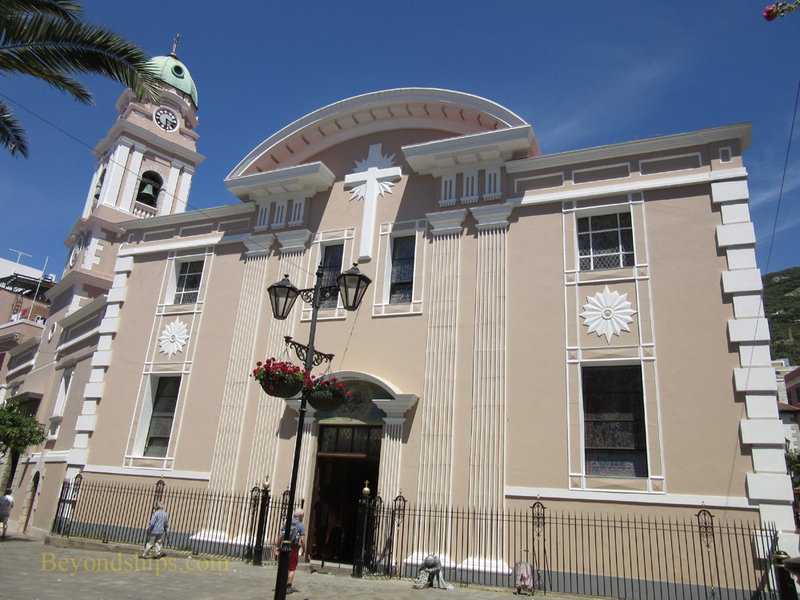 Most of the population of Gibraltar are Roman Catholic. The Roman Catholic cathedral is St. Mary the Crowned, which is on Main Street. Straightforward in its lines, the small cathedral was built on the site of a mosque in 1462. It was modified in 1810 to permit Main Street to be straightened. The bell tower was added in 1820. 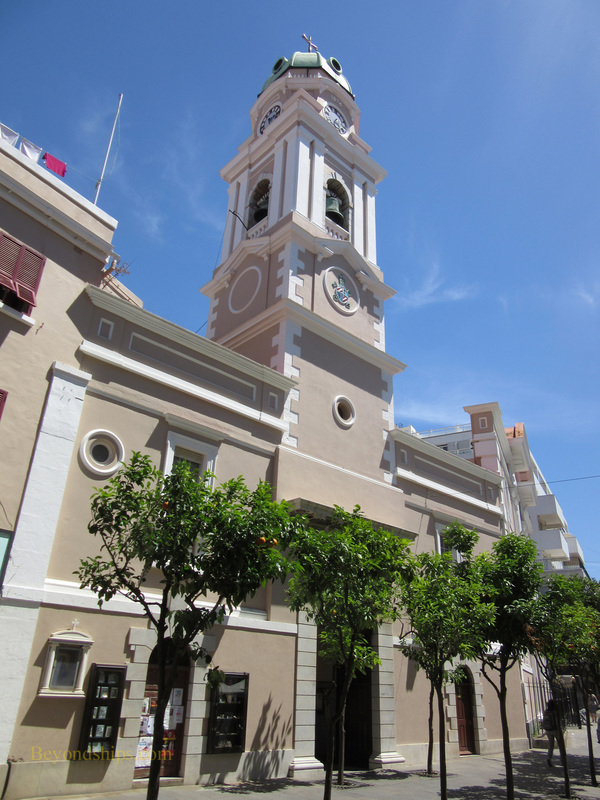 Nearby in Cathedral Square is the Church of England cathedral, Cathedral of the Holy Trinity or as it is better known - - Gibraltar Cathedral. Somewhat incongruously, this church was built between 1825 and 1832 in the Moorish revival style. It was severely damaged in 1951, when an ammunition supply ship exploded in Gibraltar harbor. Among other things, the explosion shattered the stained glass windows but the bits of colored glass were collected and used to make new windows. Adjoining Cathedral Square is the Governor's Residence. Built in 1531, it was originally a Franciscan convent and is still referred to as The Convent. Speaking of governors, nearby is the Duke of Kent House. The fourth son of King George III, the Duke of Kent was Queen Victoria's father. He was governor of Gibraltar in 1802. 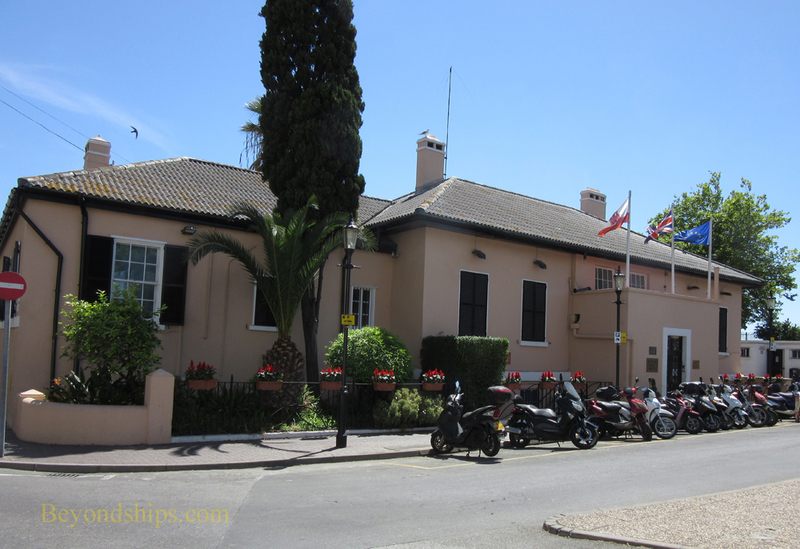 Today, the house is the home of the Gibraltar Tourist Board. Also nearby is the Gibraltar Museum on Bomb House Lane. Built atop a Moorish bathhouse, the museum's exhibitions include the excavation of the Bath House. Exhibits also tell of the geologic history of Gibraltar, the Great Siege and other aspects of Gibraltar's history. Above: The Gibraltar Parliament building. Above: The Roman Catholic cathedral St. Mary The Crowned. ​Below: The Church of England cathedral, Holy Trinity. ​Below: The Duke of Kent House.